NEC’s UC applications deliver on the promise of unifying your business’s communications by integrating with the application-supported processes your company uses every day, making it easier for employees to find and distribute information, prioritize work, and communicate efficiently. 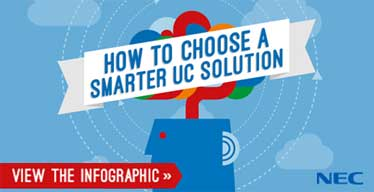 NEC’s UC solutions deliver the tools that increase performance throughout your organization. It gives you and your employees access to the latest productivity enhancing communications applications, such as user presence, instant messaging (IM), whiteboarding, application sharing, a multimedia softphone, and your UC client. UCE offers a powerful suite of customizable communication and collaboration tools, and delivers them to multiple endpoints and wireless devices. The result is an empowered workforce where employees have real-time access to the information they need and the freedom to communicate however, whenever and wherever they work.